Adding a deck to your home can add entertaining space and room for you to relax and enjoy the weather. No matter how simple or complex the project, the best to way stay on budget and ensure proper completion is to hire professionals. Deck building can require more than just a flatbed of lumber, a hammer and bucket of nails. It is common that the city or county require plan approval. In today’s suburban neighborhoods, homeowner’s associations may call for the submission of plan and specification documents. Building permits may be accompanied by fees and standing in line at the local building authority. If there’s no permit or if the finished deck doesn’t match the specification document, the inspector can insist that it be torn down, and construction started again. Professionals familiar with permit submission and requirements can take care of the hassle of standing in line and ensure the design and specs meet local requirements, saving you time and money. Current products and materials on the market may be more durable and less expensive than those available in the past. Pressure-treated lumber is traditionally used in deck building as hardwood is long-lasting and holds up to the elements. However, it also needs to be sealed and stained at regular intervals to prevent the boards from warping or splintering. 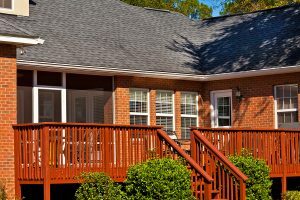 Wood and plastic composite materials, as well as vinyl, may be more expensive in the beginning, but they do not require the ongoing maintenance to remain beautiful and long-lasting. Handrails and guardrails are crucial components of deck building. Handrails add safety, providing a solid hand hold when using the stairs. Flower boxes, planters and built-in seating areas can double as guardrails, enhancing the beauty of the area as well as maintaining safety. Hiring a professional can take the guesswork out of the plans and ensure you are getting the deck of your dreams.